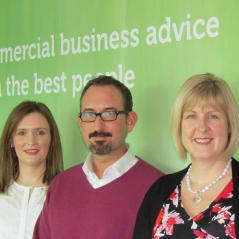 Shaw Gibbs has awarded directorships to three senior staff, Sarah Gardener, Ed Porter and Hayley Simmons, who have all successfully completed its internal Director Development Programme which prepares high potential senior managers for leadership. At age 28, Accounts Director Sarah Gardener becomes Shaw Gibbs’ youngest ever Director. In addition Ed Porter, a highly experienced audit specialist becomes Director and and we are delighted to welcome Hayley Simmons back to the board, having previously been a partner, Hayley has been an Insolvency Practitioner with Shaw Gibbs for over 18 Years. The Shaw Gibbs Director Development Programme (DDP) is unique to the firm. It aims to nurture the firm’s future leaders by developing participants’ leadership skills and shifting their focus from operational management to strategic direction. The Programme typically takes 12 to 18 months and is designed in consultation with the participants, enabling them to focus on their areas of interest. Modules are a mix of internal and external training courses and workshops plus psychometric profiling. Participants receive detailed feedback on their leadership abilities and are fully supported throughout by their line manager and sponsoring Director. Because it is developed and managed by Shaw Gibbs, the Director Development Programme creates a career development path in line with the firm’s core values - professional, commercial, fair, dynamic and fun. The Programme is led by The Shaw Gibbs People Focus Group, headed by HR Manager Kerry Whitfield with three Directors. Accounts Director Sarah Gardener joined the Shaw Gibbs Business Services Division in 2013 and quickly established close working relationships with clients and other professionals in the Thames Valley. An FCCA with over five years PQE in practise, she is experienced in the preparation of statutory accounts for a variety of businesses, as well as having a strong focus on clients’ systems and procedures in order to provide up-to-date management information. Audit Director Ed Porter has been an accountant since 2000, bringing a wealth of experience from a diverse, international career. Having held numerous directorships in private and public companies, he is fully able to see things from the clients’ perspective. Director Hayley Simmons qualified as the youngest Insolvency Practitioner in 1998 and specialises in all areas of Insolvency and Corporate Recovery. She joined Shaw Gibbs over 19 years ago from KPMG and has been instrumental in helping to grow the firm’s insolvency and recovery team.